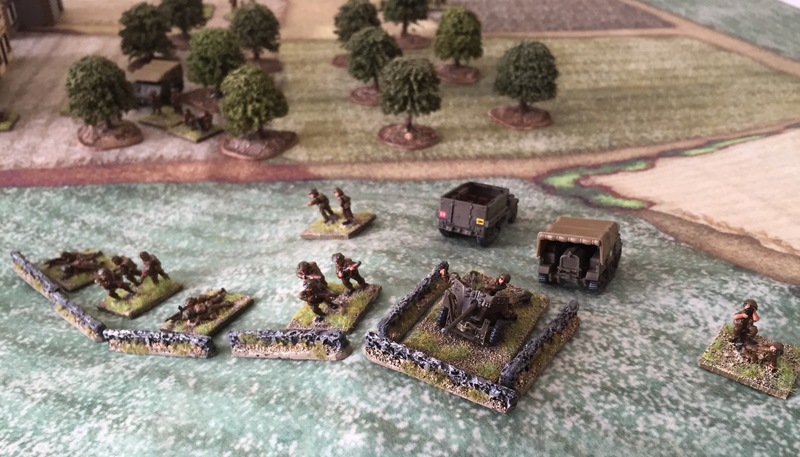 With the D-Day anniversary this weekend, it was an apt time to break out the 15mm Normandy forces, but as I’d played a lot of the Battlegroup rules lately I decided to try PanzerGrenadier for a change. 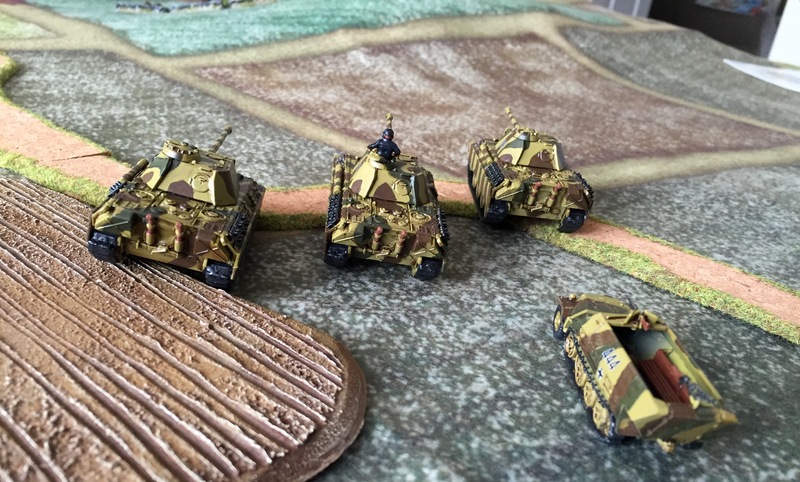 It doesn’t seem like a year since I last played these rules, but it is (almost to the day) – however I have now switched from 10mm to 15mm as my scale of choice for company level WW2 (and it’s taken me a year to get enough stuff painted to play a game 🙂 ). I chose the Rauray scenario from the “Battles for the West” book. I only got 2 turns played out of the 14 allowed by the scenario before I had to suspend the game due to real-life (work intervened), but I got to play through most of the rules so it was worth doing as a refresher. 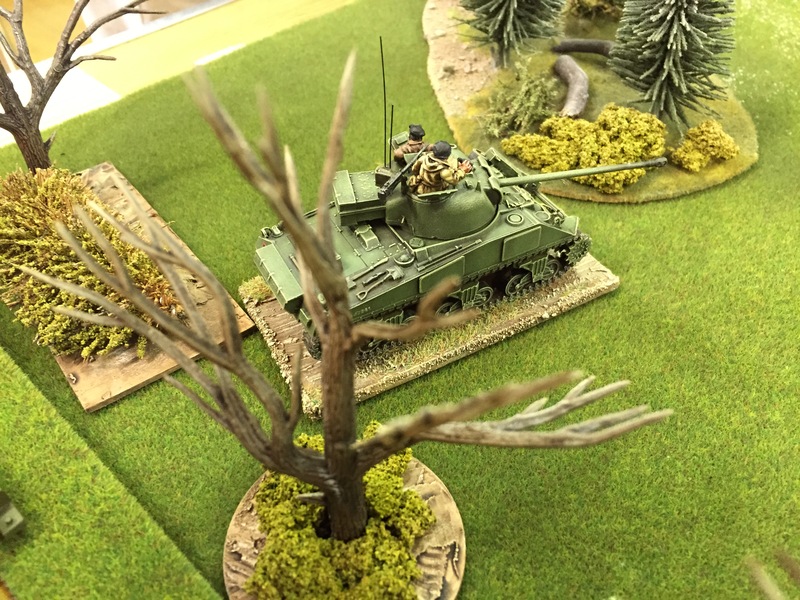 The British 6pdr which was in hidden ambush mode managed to get the 3 APDS shots it was allowed under the scenario off without being spotted, but they bounced off the front armour of the Panthers. When the German recce 250 tried to spot the 6pdr in ambush, another 6pdr destroyed it. In doing this the 6pdr revealed itself to the German artillery spotter who successfully called in one of the 2 allocated direct fire missions he had. A double six for effect left most units in the wood in bits, with a command section dispersing. 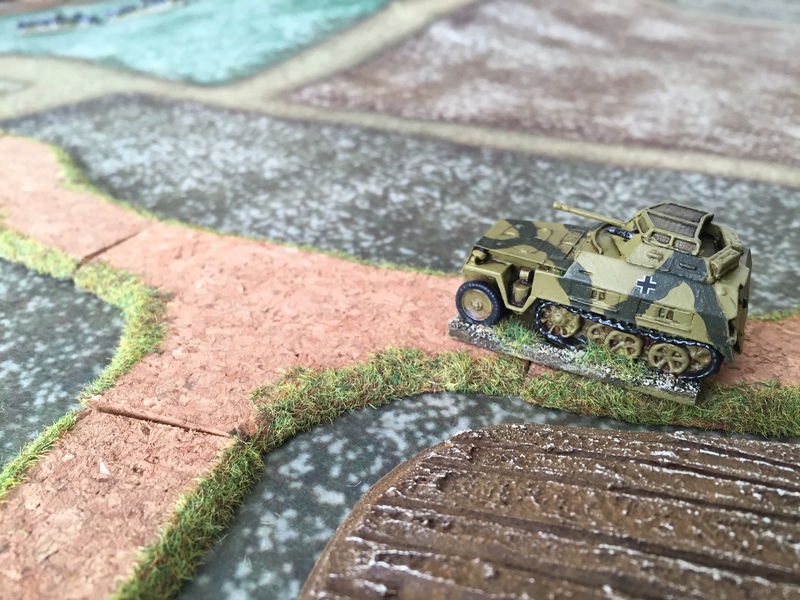 The Hanomag mounted mortar also scored a double 6 for a direct hit, but only managed to suppress the third 6pdr after it had suppressed & damaged a Panzer IV on defensive fire, then suppressed a command Panzer IV in the British phase. 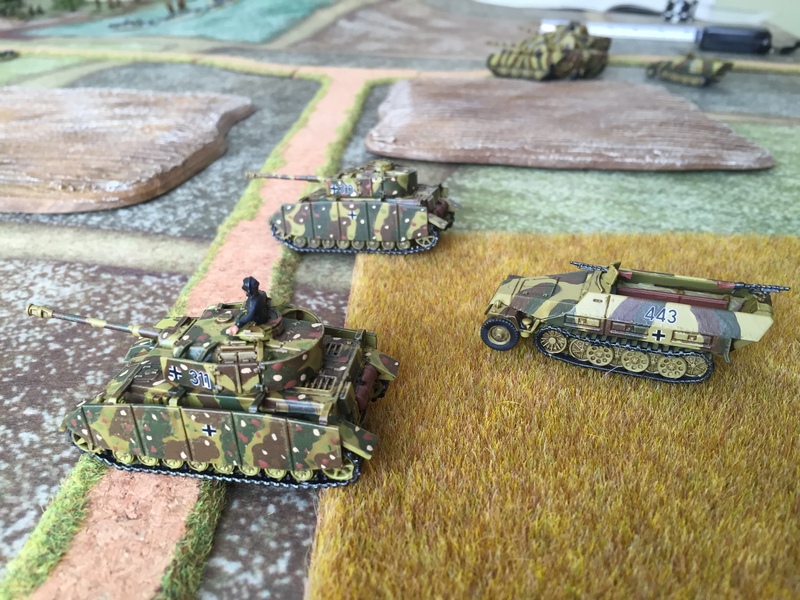 The Panthers advanced on contour 110 supported by dismounted infantry, and during the exploit phase the company command deployed another infantry platoon 6″ in front in support. 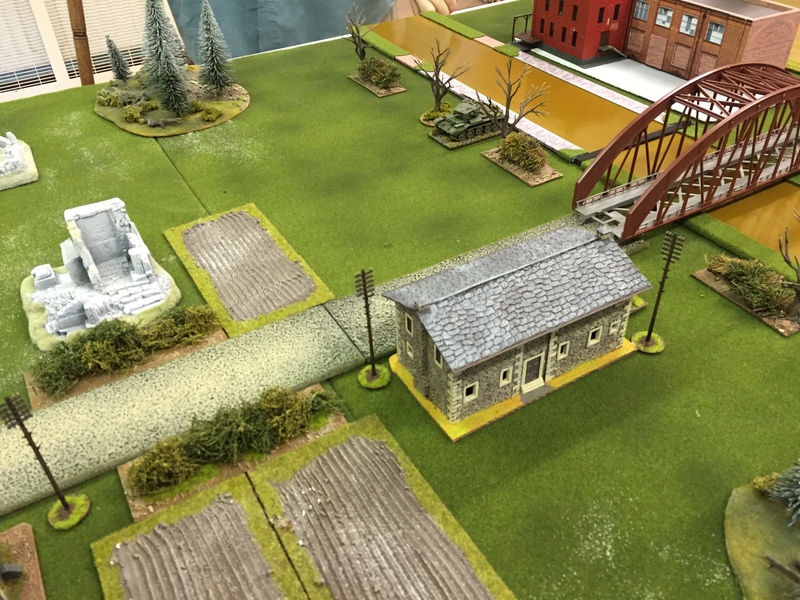 With the assault on the hill building to a climax and the British FOO poised to call in a barrage, I had to abandon the game but I expect to re-run the scenario again soon. 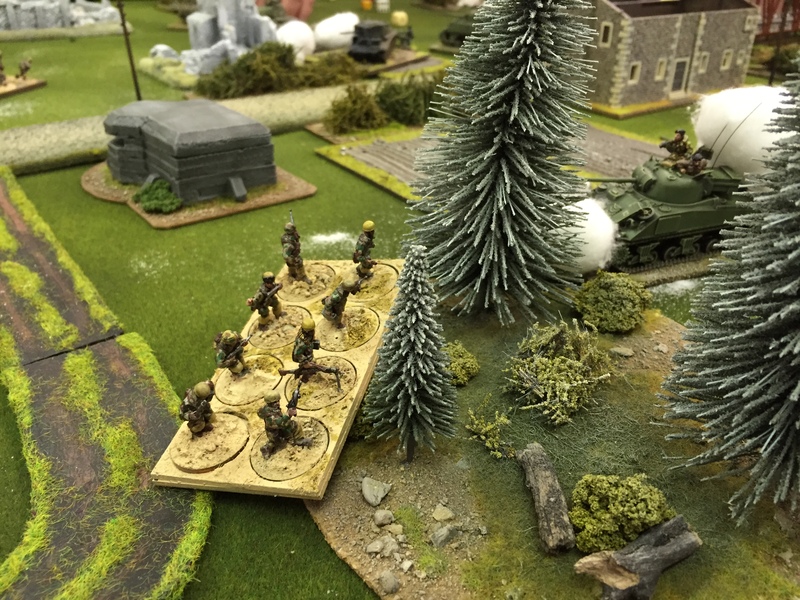 Once again the rules gave an exciting and fast-moving game – recommended. 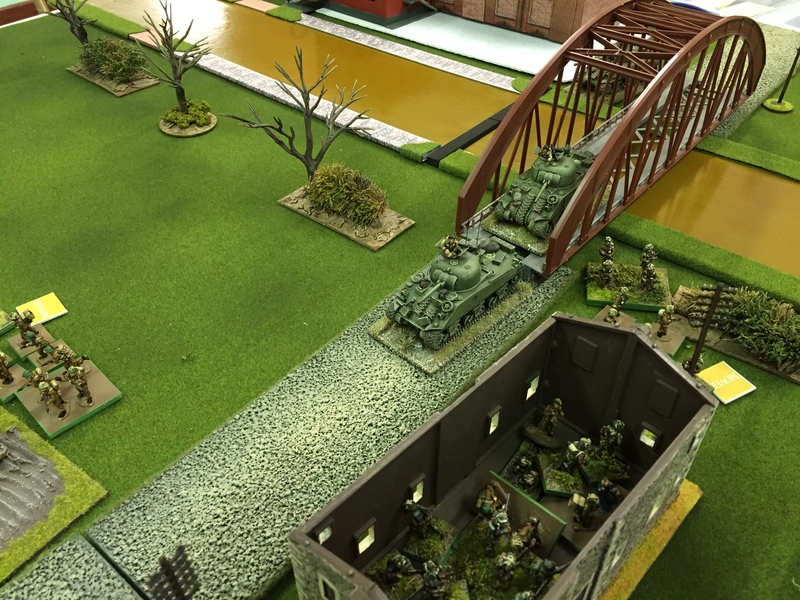 The bridge and Cromwell recce unit. A fair bit of nostalgia involved in this one. 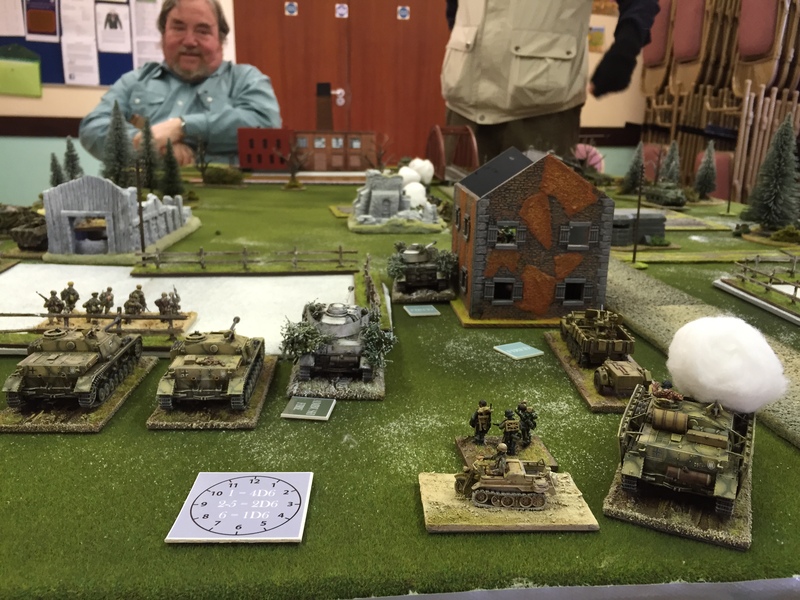 I just happened to be in Belfast when the Ulster Wargames Society was meeting so these folks kindly set up a WW2 game for me to get involved in. The last time I attended the club was over 30 years ago when it was called the Ulster Military Modelling Society and met in the Labour Party offices – amazingly there was a Labour Party in Northern Ireland back then 🙂 . 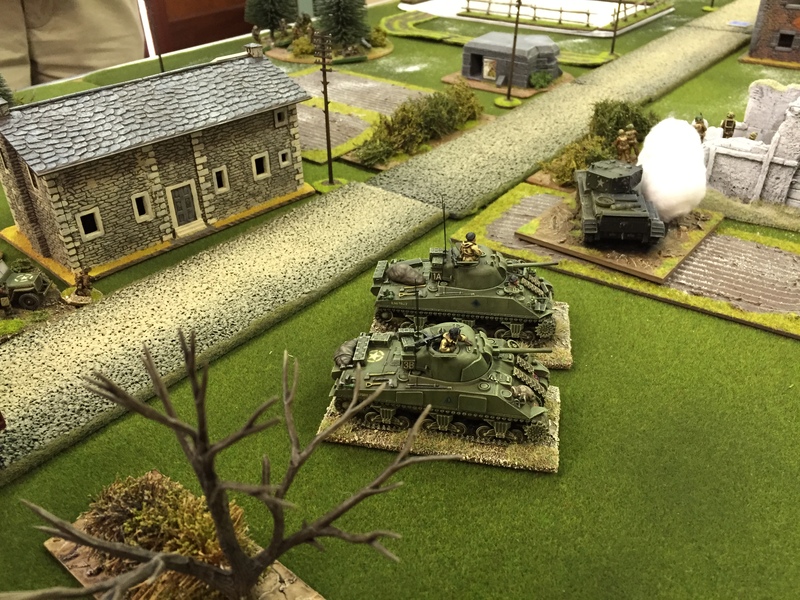 Also, the game was in 20mm, the scale David and myself cut our teeth on using Charles Grant’s “Battle” rules with Airfix and RoKo vehicles. The RoKo stuff was sold to us by Cameron who also was in attendance – I think we last had a chat Colours in the Hexagon at Reading in 1990 when he owned the Platoon 20 & Freikorps business (? ), the first (and last!) time my now wife came with me to a wargames show 🙂 . Anyway, on with the game. 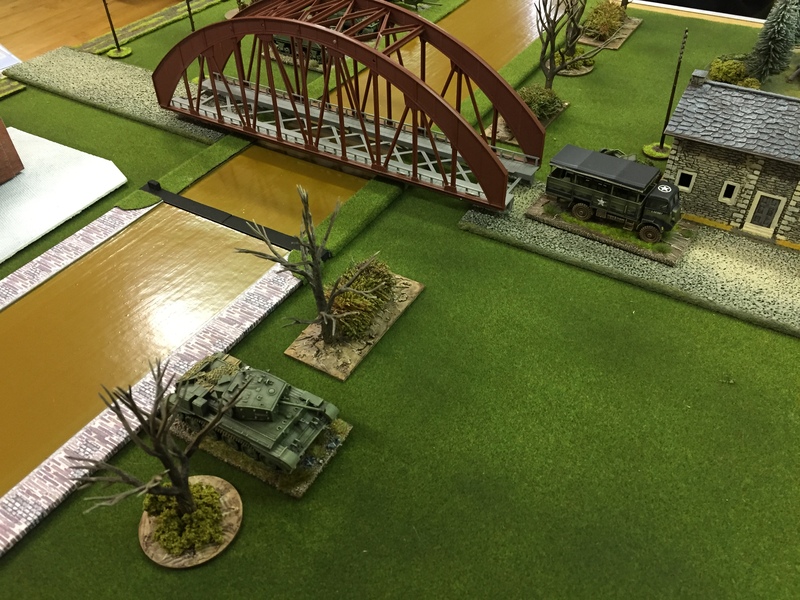 Gary (aka Sgt Steiner) joked that he would get a write-up of the game on his blog before me (hardly a challenge as I wasn’t back in England until Monday night) but true to his word he did – his report is to be found here. I was given command of the Fallschirmjager part of the German command which was initially in reserve. 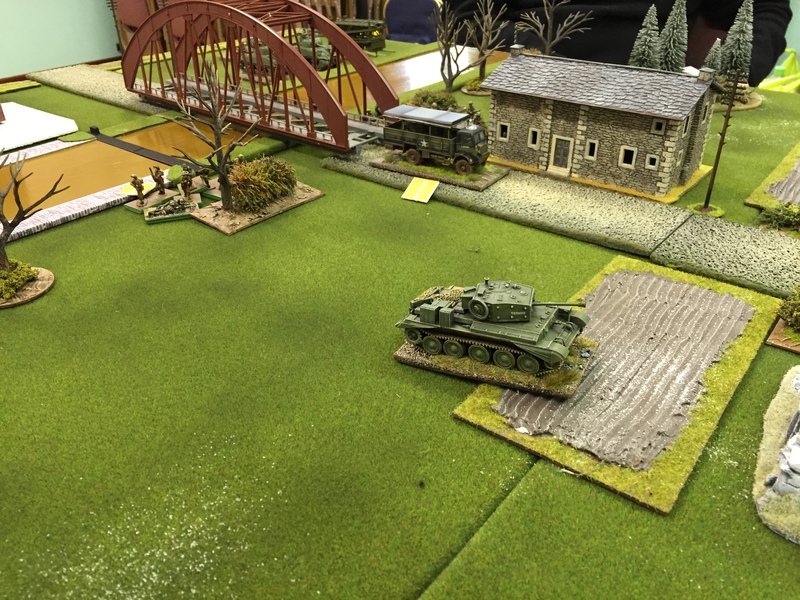 This was a good idea as it allowed me to brush up on the rules, although with my usual crap rolling for arrival rolls I didn’t turn up until turn 3 and even then on our own baseline with only a couple of units (if I’d rolled right I could have flanked the British). 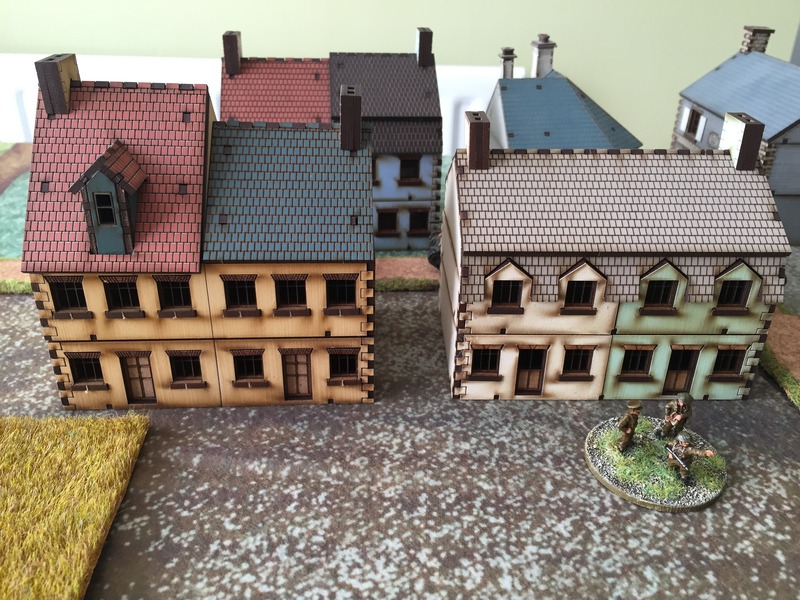 On the plus side that saved my troops from the turn 2 aircraft and artillery strikes on the house the German infantry had all been magnetically drawn to. 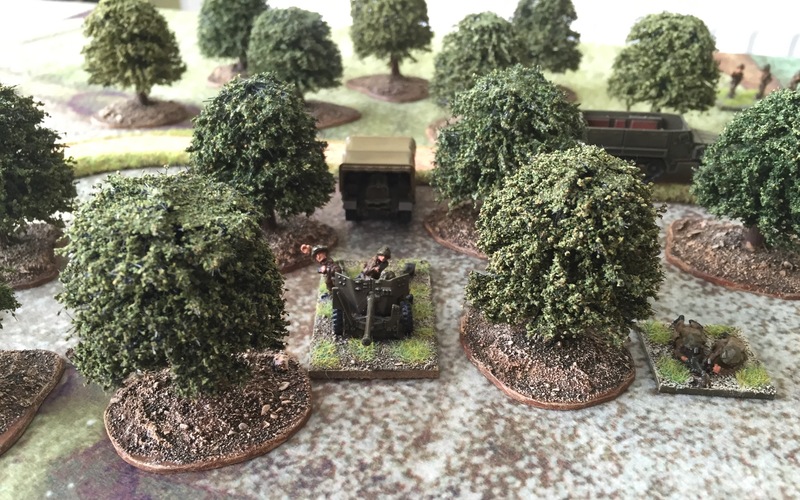 It was a game of 2 halves as the old saying goes – initially David and myself couldn’t roll up enough orders so were on the back foot, even losing the closest objective to us (a forest). 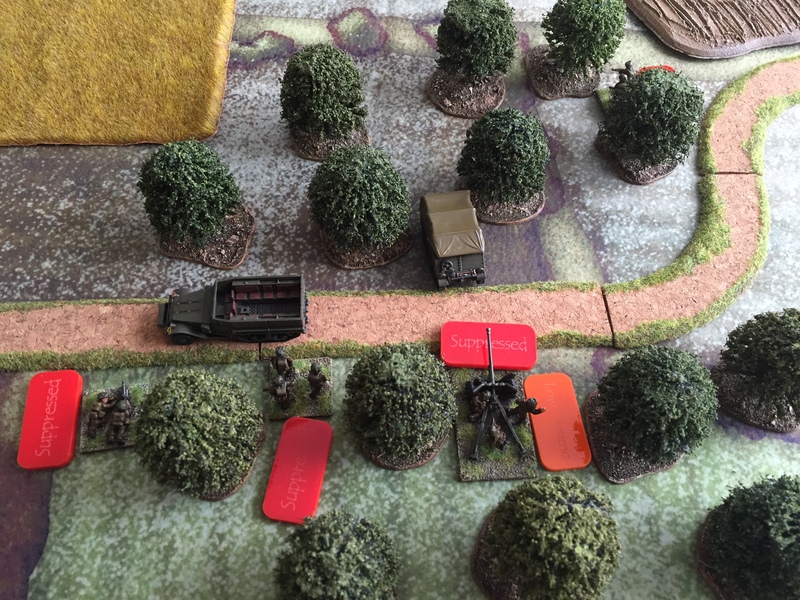 However, having a larger breakpoint due to fielding 2 platoons meant we were more resilient than I thought – we could take the losses and at the end of the game found we had consistently drawn lower morale counters than the Allies. 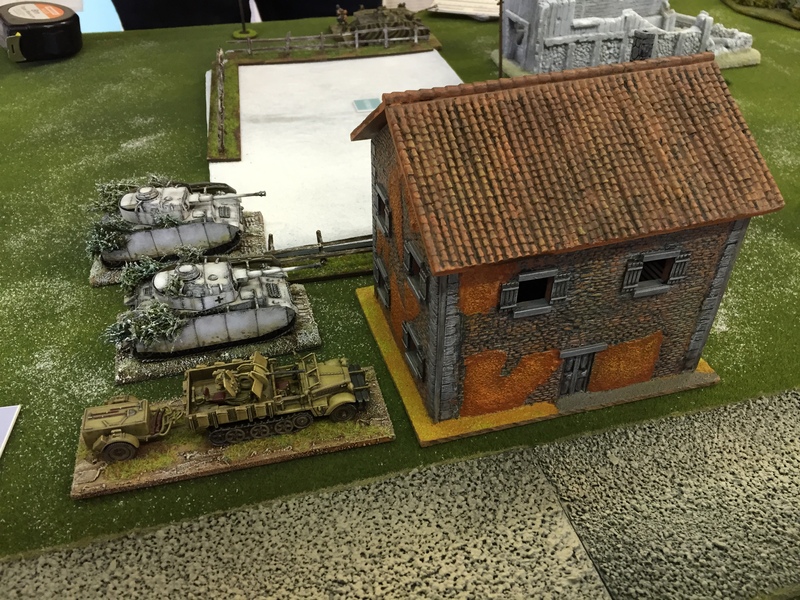 The Allies suffered from low order rolls in the 2nd half of the game, while the Germans were rolling high just as my units were getting onto the board. 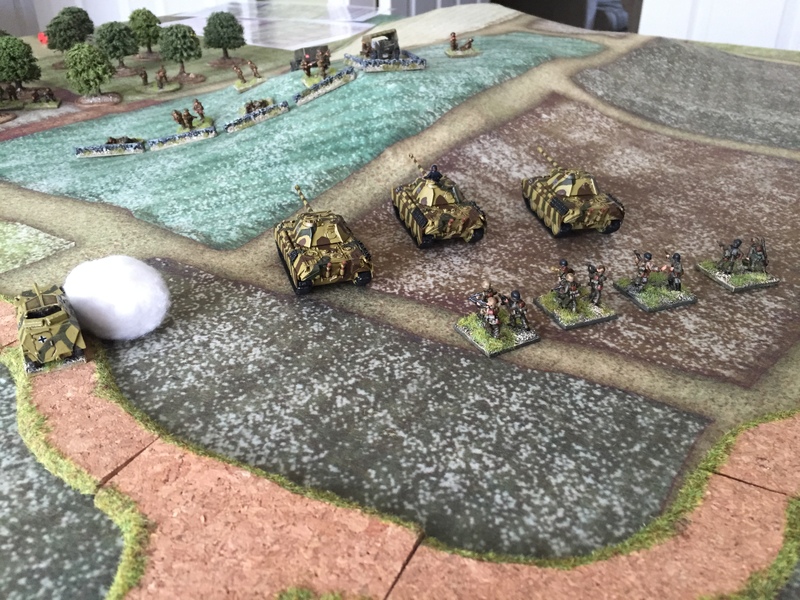 Once they had lost most of their armour the Allies hunkered down and withdrew, taking up a defensive stance and wanting the Germans to come to them and take back the objectives. 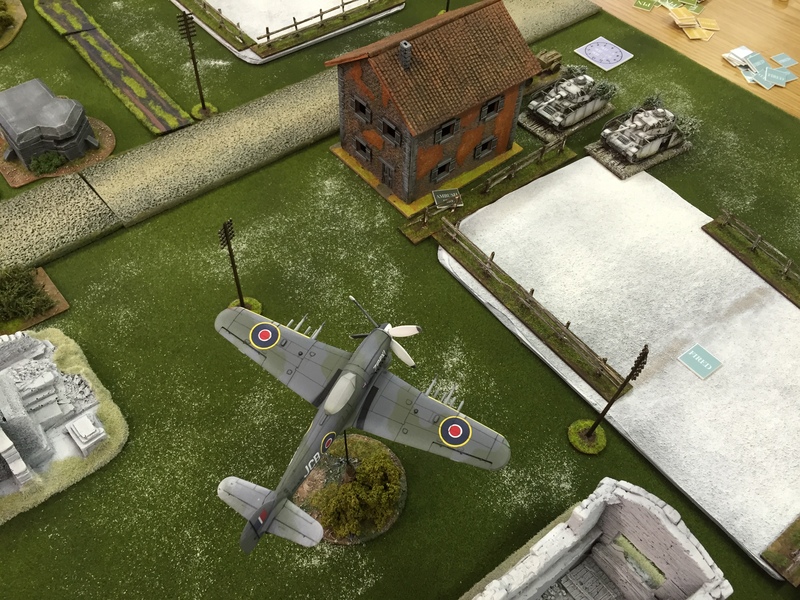 A clever enough tactic until we had to draw a morale counter and a Luftwaffe FW190 showed up (I rolled a 6 – amazing) with 8 bombs and 2 autocannons and actually hit stuff. 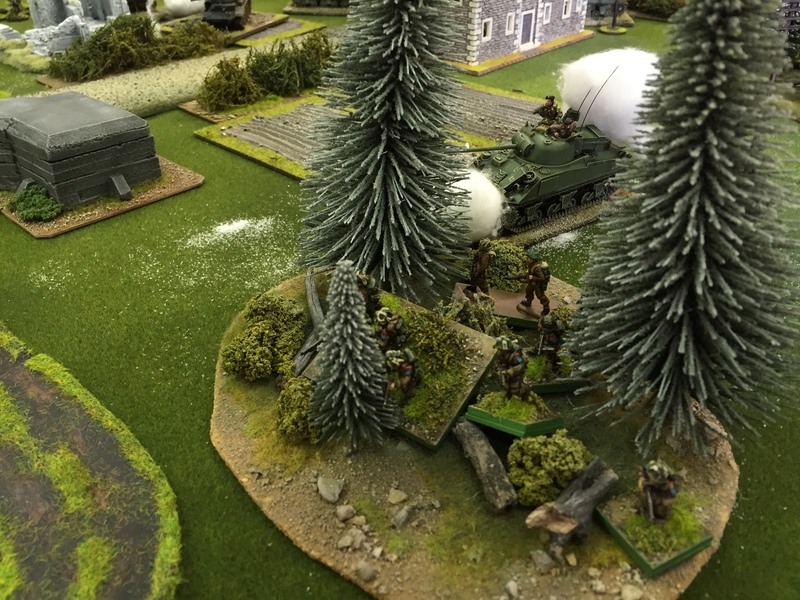 I was able to co-ordinate a close assault on the forest objective and the loss of the Allied troops inside took them over their breakpoint. P.S. I went to the Pro12 rugby final at Ravenhill after this game then rounded the day off with an Indian meal with my family – as perfect days go, it doesn’t get much better than this!